Joining the fight against domestic violence. 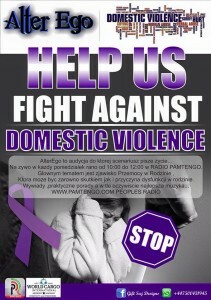 Alter Ego is a programme aired on Pamtengo radio www.pamtengo.com This programme is designed to create awareness and educate anyone in the community who is subjected to domestic violence. Our main concern is to reach out the those individuals who are struggling to communicate due to language barriers. Domestic violence is officially classified as “any incident of threatening behaviour, violence or abuse between adults who are or have been in a relationship together, or between family members, regardless of gender or sexuality”. •talk to your doctor, health visitor or midwife , send a message via text to us here on Alter Ego or via our facebook page. if you threaten danger immediately call the police at 999 . When the connection to the operator say “police” and enter your address. Even if you will not be able to explain what was going on patrol will be on the way. Call to this number are free from mobile homes and public telephone booths. This is not so in the case of mobile phones. ADT Healthcare offers a free helpline dedicated to helping women suffering from drug, alcohol and mental health issues. ADT Healthcare was established in 2011 by people who overcame drug and alcohol addiction themselves.